Sharon Hewitt on BBC The One Show sofa! 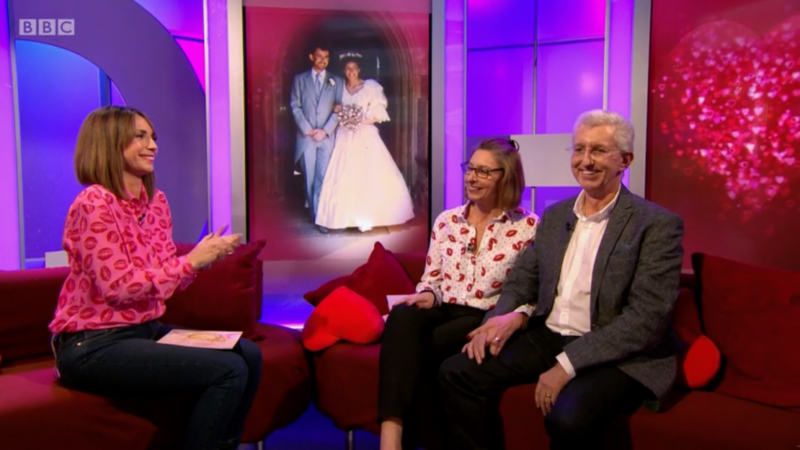 We had a Valentine’s Day to remember; we went from our average daily life to sitting on the BBC The One Show sofa! I didn’t think that when I sent an anonymous Valentine’s Day card 29 years ago it would lead to Paul and I being interviewed by Alex Jones on live TV. 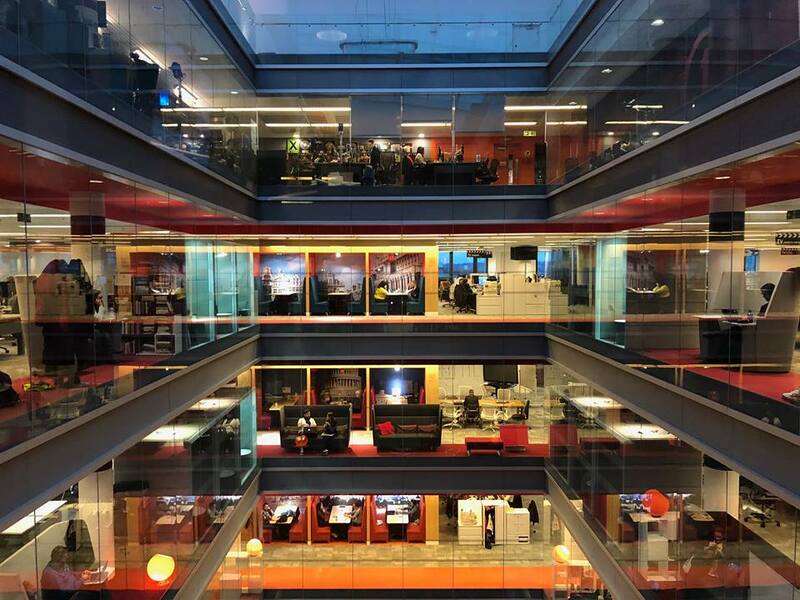 Feeling excited to be invited to the BBC in London was an understatement! 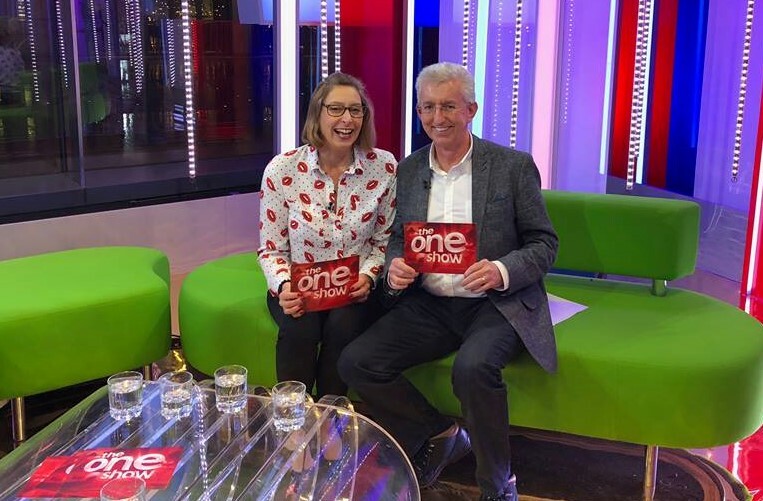 The One Show is watched by an average 4 million viewers per day and walking towards Broadcasting House was surreal and exciting in equal measures. When we arrived outside The One Studio there was a car stunt driver carrying out some manoeuvres and a group of roadies setting up for Leona Lewis for her part of the show. It was as if I had entered a twilight zone. On entering the BBC I was given a BBC pass and I tried to look cool while wearing the lanyard around my neck, but secretly inside I did a little dance with excitement. A runner with headphones and a walkie talkie collected Paul and I. 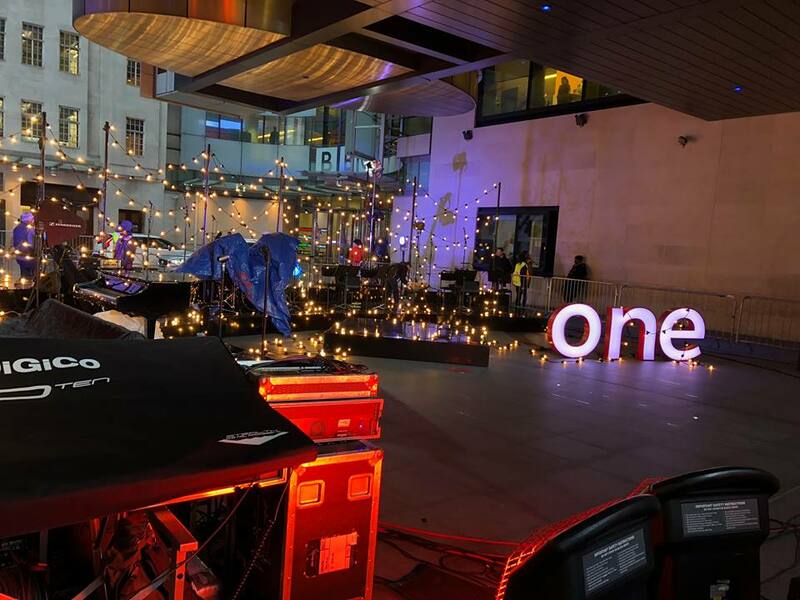 We walked past a large ‘The One Show’ sign and I had to ask if I could take a photo of it as I thought this was so cool. We were taken up to the Queen Victoria room (a nod to the EastEnders pub) where we were met with the shows researcher and producer. We met two other couples who would also feature on the show and talked through the running order. A selection of food and (soft) drinks arrived while we were taken off one by one for rehearsals. Meanwhile make-up artists arrived with a suitcase, yes, a whole suitcase, of make-up which made us laugh! 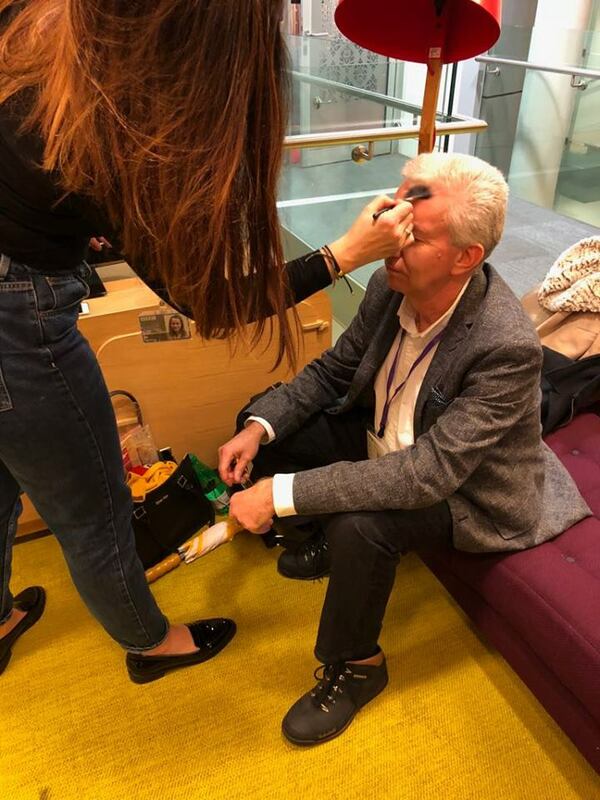 My poor husband looked aghast but, to his relief, they only lightly dusted his face with powder to stop the glow of the lights in the studio! While waiting I couldn’t resist the opportunity to walk around and take a few photographs. It was so strange to look into the news studios, which we watch daily, from the inside. (See photographs). When we were taken down to the studio our first impression was how small it all was. Watching it on the TV it seems that the space is huge. We watched Matt Baker and Alex Jones run through the rehearsal and saw the calmness that was on screen, but behind the camera there were a host of film crew, producers, directors, sound people, script editors, researchers and lighting engineers; so much going on we were transfixed by it all. We watched as Troy actor Jonas Armstrong and DJ Edith Bowman were being interviewed, along with singer Callum Scott. Dr Sarah Jarvis gave advice on the MS section and then the show headed to showcase the stunt drivers who we had seen earlier. Then it was our turn. We were sat on the sofa with our photographs on the towers behind us. The photos were from way back when we first met and our wedding photo was there too. We were asked to talk about how we met via a Valentine’s Day card (see link to our story here). Alex Jones was lovely; she conducted the interview so well that that it felt like a very natural conversation and we enjoyed the opportunity immensely. In summary, our experience with the BBC and being interviewed was thoroughly enjoyable and we would do it again in a heartbeat!